#1: What’s important to you? Perhaps the scariest question, especially as a 17-year-old, is identifying key things in your life that are important to you. Maybe it’s staying closer to home to be near your family and support circle? Or just the opposite, maybe you want to look at out-of-state schools and grow your independence? Do you value small communities? Investigate small liberal arts schools or be sure that the large schools you are looking at provide inclusive, smaller communities. Is your religious or affiliate group an important part of your life? Ask college representatives about those communities on their campus. #2: Do your schools “fit” your needs and wants? Choose colleges that meet your needs, both inside and outside of the classroom. That way, you’ll have a variety of colleges to choose from where you can be happy and successful. Do you want to study engineering? Look into each schools’ engineering options as you explore. Maybe you see yourself on a campus with a ton of school spirit, rallying around a sports game - try universities with D1 athletics. Or perhaps you want to spend your junior year traveling- look for colleges with strong study abroad and abroad financial aid programs. #3: Do your schools prioritize student success? Research the 4 and 6 year graduation rates of schools when investigating your options and creating your list. Graduation rates are a great indicator of how schools support students, and all students “should attend a school that prioritizes student success, i.e. graduation” says DSST’s College Success team. As you do this, be sure to check out how schools approach financial aid. It is no secret that college is a huge financial investment. Consider how the schools will give you and your family the support you need to make it through your degree - and not just the first year. #4: Is your list balanced? 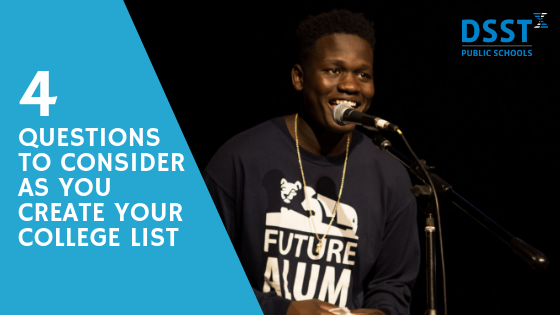 Finally, make sure your list has a variety of schools you could attend and be happy and successful. Challenge yourself and aim high, but make sure you identify a wide range of “likely,” “target,” and “reach” colleges to consider. “Likely” schools = your academic profile is significantly stronger than the middle 50 percent of students who are typically admitted. “Target” schools = your academic profile is similar to that middle 50 percent. “Reach” schools = your academic profile is not as strong as the middle 50 percent. All this information can be found on the school’s Admissions website. If you’re not able to easily locate it, just call the Admissions Office. Reach for that “dream” college, but keep realistic expectations. On the flip side, don’t include a “likely” you’re not that thrilled about just to have a “backup.” Plus, if all the colleges you choose are great fits (see #2), you’ll be happy to attend any of them! There is a college out there for everyone, and you’ll find it with some reflection, research, and resolve.